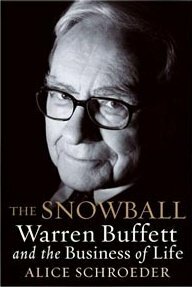 I finished reading The Snowball: Warren Buffett and the Business of Life . I’m sure my wife will be delighted I’m finished. Every time I learn something new about Buffett I tell her about it. I found the book motivating because Warren Buffett is one of my mentors. Although, I have never met Warren Buffett I try to learn as all I can about him and his business. It’s fascinating that Warren Buffett is friends with one of my other mentors, Bill Gates. Someday I hope to meet Warren Buffett and Bill Gates. I try to live my life on the old adage about standing on the shoulders of giants. I try to learn as much as I can about the people I idealize and turn them into my mentors. In theory if I learn from the masters I will save myself years of trial and error. I found the book to be well written and full of detail about Buffett’s ups and downs. I fully recommend this book to anyone interested in business and investing. Anyone not interested in business or investing might not enjoy this book.